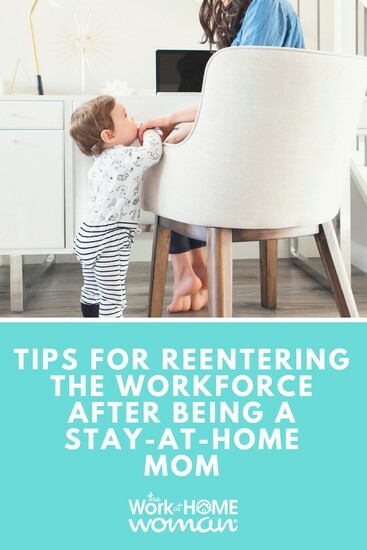 Today we're answering a question from a reader about reentering the workforce after being a stay-at-home mom for 12+ years. Read on to see what tips we have for those of you who are reentering the workforce after a long absence. I have been a stay-at-home mom for over 12 years. I've been trying to find a job for over a year and a half with no luck. I have an extensive (over 20 years) background in health insurance. I can't figure out why I am no longer hireable. Is it the lapse in my employment? My age 52? I'd like to find something part-time as I have an 11-year-old son. Do you have any suggestions for a low morale stay-at-home mom who is beaming with tenacity to find her second act and help contribute financially? Your opinion is greatly appreciated, and I love your website. I know the feeling. After being a stay-at-home mom for nine months with a dwindling bank account — I felt the same type of pressure. I looked high and low for legit work-from-home jobs, only to be lead to scams and internet marketing schemes. Luckily, my persistence and networking efforts paid off with a part-time marketing gig which eventually gave me the funds to launch this blog. The road to finding a job starts with a well thought out plan. To create that plan, you'll need to take a personal inventory to uncover your skills, your reason for working, and many other factors that go into finding the perfect occupation for this stage of your life. Would I like to work full-time or part-time? Do I need to be a W-2 employee or am I able to do contract work (1099)? What are my skills, passions, training, and experience? Do I need a job or would I like to start a business? What do I absolutely NOT want to do for work? How much money do I need to earn each month? Would you like to work for your previous employer? By answering these questions, you can narrow down which path to take and where to start taking action. For any job search, you need to update and polish your resume. A work-at-home job is a highly coveted position, and employers are looking for the cream of the crop. Update and freshen your resume, references, and cover letter to make sure you stand out from the crowd. Remember to tailor your resume to each specific job that you are applying for. Nowadays resumes are first scanned by ATS (applicant tracking systems) searching for keywords and phrases that were used in the classified ad or job description, make sure to incorporate these into your resume. If you’ve been out of the workforce for a while, remember to add noteworthy accomplishments that may boost your credibility; volunteer experience, helping out with a family business, personal blogging, bookkeeping for your church, coaching your son’s little league team, or being treasurer of your son's Boy Scout troop. The key is not to highlight the absence of traditional work, but to address your strengths and skills. Remember you don’t have to format your resume in a chronological manner – instead use a skill-based layout. If I were to reenter the workforce as a nurse, I would definitely need to take a refresher course. It’s only normal that after being out of the field for an extended period that your skills are going to get dull. Consider enrolling in a refresher course; many can be taken online and are relatively inexpensive. However, if you have the chance to enroll in a class where you need to be physically present – this gives you an excellent opportunity to network and connect with other like-minded individuals. If money is the only barrier from keeping you from getting additional training — try some of these methods for bringing in cash quickly. Related Content: As a Parent, Should I Go Back to School? While you may have lost touch with your prior professional connections, as a mom you have gained a whole new set of connections, which can be just as valuable. Talk to the other moms in your circle and let them know about the challenges you’re facing. Some may be able to offer advice, others may know of opportunities, while others may be a source of support and motivation. Make sure that you check out resources like iRelaunch.com and reacHIRE as they offer workshops, events, articles, success stories, as well as a list of companies that offer return-to-work programs. Lastly, get involved on LinkedIn in a big way. Connect with former employers and employees, as well as target and follow companies you’re interested in working for. LinkedIn not only allows you to update your virtual resume, but you can showcase your work, and highlight recommendations, as well as search their vast bank of available jobs. One of the biggest challenges for women when searching for a work-at-home job is actually finding legitimate job postings. To help you with that I've compiled a list of reputable resources which can be seen here. Informational interviews are informal conversations that are had with current people who are employed in the position you'd like to obtain, or with an employee of a company you're interested in working for. The great thing about informational interviews is you get a chance to find out all about the company or occupation without taking the risk of actually going down the path yourself. To find people to interview you can search on sites like LinkedIn, you can ask around on Facebook, or you can even try using a networking app like Shapr. If done right, informational interviews can lead to valuable new connections and sometimes employment opportunities. After you’ve applied for a job, give it a couple of weeks then send a follow-up message. If you were referred by a friend, family member, or colleague, wait a few days, then follow-up. By doing this you can ensure that your resume made it to its correct destination, and it also shows that you are a person that takes the initiative. While it is fine to periodically check in if the process is taking a while — don’t be pesky. Most importantly, keep searching for new jobs and submitting applications. According to this article on Career Pivot, it usually takes between 6 months to 2 years to find a job. A couple of other considerations to take into account is those who are older (55+), and those who are looking for higher paying jobs ($100,000+) tend to take even longer. The key is to be patient and persistent. Even before you get an interview, you need to take time to practice your interviewing skills. One of the best ways to do this is to gather a list of common interviewing questions and practice answering them out loud. Do this over and over again until you’re comfortable answering them on the spot. Along with this you need to thoroughly research the company and know some background information on them. Many companies will ask you, “Why do you want to work for us?” and you will need to come up with a good answer. Having this background knowledge will not only help you to answer the question, but it shows the interviewer that you’re well prepared. Upon completion of the interview make sure to ask the hiring manager when they will make their final decision. This gives you a time frame on when it’s appropriate to follow up. Remember to promptly send a thank you note after the interview. Handwritten notes tend to score the most points with managers, but if they are making a decision quickly or you don’t have a physical mailing address an email will work just fine. Since you’re applying for a telecommuting position, it’s very likely that you’ll be interviewed by telephone or Skype, if that’s the case make sure to check out these tips for a great Skype interview. Briefly above, I mentioned checking out some quick ways to make money, so that you can get some cash rolling in. I think exploring other career paths such as freelancing, temporary work, completing short tasks or odd jobs is a great way to get some money coming in while gaining new skills and connections. You never know when one opportunity will lead to another. Make sure that you’re thinking outside the box and looking at all of your options. Try searching for opportunities by your skill set, not just your occupation. Your insurance and healthcare background, paired with a love of writing, social media, sales, teaching, etc. could make you the perfect candidate for another type of position within the healthcare industry. Finding a job after you've been out of the workforce for an extended period can be a daunting task. Try to stay positive and keep forging ahead — your dream work-from-home job is out there! What tips do you have for reentering the workforce? What advice or inspiration can you offer? Drop us a note; we'd love to hear from you! Originally published February 26, 2014. Content updated October 2, 2018. OMG! Holly, I just checked out your awesome website. Stumbled across it. You have so many great ideas and links to help people. This is awesome. I will really have to let people know about your website. I’m not a stay at home mom but there are other interesting content that I can certainly use. Sorry, no website as yet but following your advice on getting one with WordPress. Good luck with your blog and keep me posted on your progress.